With the arrival of HTML5 web development has turned into the sunny side of the hill again. These days the world would be a perfect place if I could launch two browser instances at the same time, one with support for the latest standards (almost) and another without. 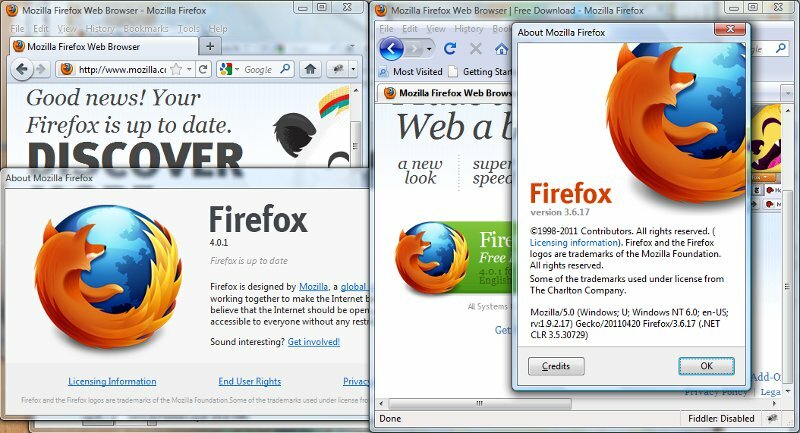 This is something that has been documented online, but from fragmented sources: it is possible to have Firefox 3.X and 4 installed and running at the same time. Actually, it's quite simple as the whole installation process takes less than ten minutes. 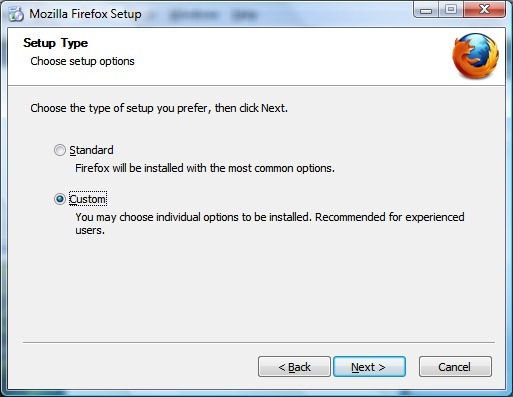 This one is a no-brainer: you should install both Firefox 3.6 and 4 in separate folders. For Windows, this means using different folders and creating separate shortcut icons. For Linux, it means installing Firefox 4 from your favorite package manager (.rpm or .deb) and downloading Firefox 3.6 as .tar.gz and uncompressing it somewhere like /usr/local/firefox3.6 (depending on your Linux version, you may prefer to do it the other way around). 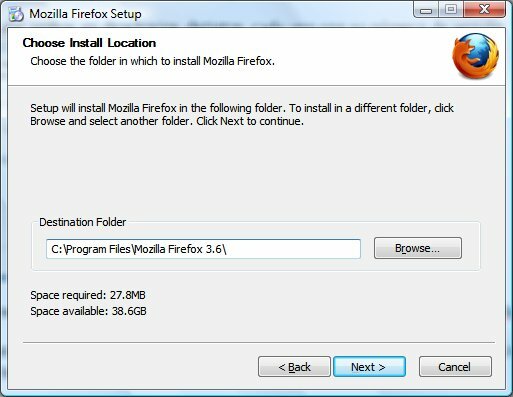 In both cases, you need the link to download an older version of Firefox, which is somehow hidden in their website (search for "All systems and languages" and "Other Firefox Downloads", or just click here). Firefox will check at launch time if there is a running instance and attach to it instead of starting a new one, which is definitely not what we want since it will not check for versions in the process. Launching 3.6 will result in your existing Firefox 4.0 window getting the focus, but nothing else. No new window. No "ta-daaaa!" This behavior can be overriden by adding -no-remote to your program shortcuts (Windows or Linux). That will skip the check, and your new window will open. You may be able at this point to launch separate windows for Firefox 3.6 and 4 at the same time, but this is no good if they start stepping on the plugins of each other. The plugin release that may be valid for 3.6 is not for 4, and viceversa (fact is, anything other than Firebug has big chances of not having been ported to Firefox 4 yet). You need separate plugin folders. Create two separate profiles, which will allow for two separate sets of plugins. I like to name them "Firefox 3.6" and "Firefox 4", in an attempt to be original and unexpected. They will be stored inside your user home folder. Accept and close the window. 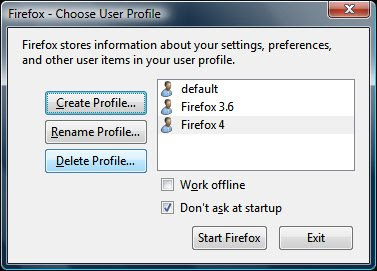 /usr/bin/firefox -no-remote -P "Firefox 4"
/usr/local/firefox3.6/firefox -no-remote -P "Firefox 3.6"
"C:\Program Files\Firefox 4.0\firefox" -no-remote -P "Firefox 4"
"C:\Program Files\Firefox 3.6\firefox" -no-remote -P "Firefox 3.6"
That's it. Now you can develop using both versions with separate Firebug installations. This is an excerpt of the first lab in our HTML5 and CSS3 course that is starting tomorrow. This 4-day course includes 20+ labs filled with polyfills, mobile and print CSS, Internet Explorer workarounds, transitions, form controls and mostly everything under the CSS3 / HTML5 sun.